De Nederlandse Dutch design PoppenVilla by Liliane®. Bing Bang Pouf Canada: "Oh wow! No plastic, no pink, no shapeless design that takes kids for idiots… Just a simple and clean design, that helps kids to learn something we should all instil: less is more. Sharp details." De mobiele PoppenVilla is zowel voor jongens als meisjes geschikt, door de aanwezigheid van een auto-hellingbaan. "[...] Mentre pensa in grande Liliane che propone una villa su ruote, perfetta per farci giocare bambole e bambolotti." 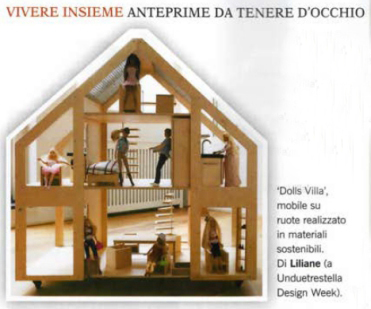 "[...] While thinking in large Liliane proposing a villa on wheels, perfect for dolls and dolls play." Dollsvilla per bambole (e bambolotti) su ruole (da UnduetrestellaSTORE, prezzo su richiesta). 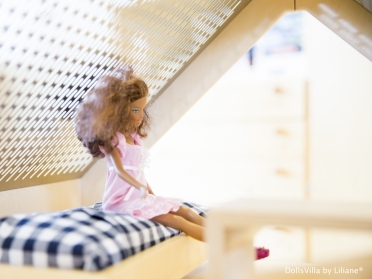 Have you ever wondered why children [and not only they] love the dollhouse? The answer lies in their imaginative power and in the many stories that come to life between those small walls, taking us elsewhere for a while, into enchanted worlds, to experience new adventures every day. Have you seen, for example, the beautiful Stettheimer Doll House by artist Carrie Stettheimer, located at the Museum of the City of New York? Built between 1916 and 1935, this dollhouse is a true treasure trove of stories. And not only because it is located in a museum and every day is crossed by the look and memory of thousands of visitors, but also because in its rooms are miniature works of art, created specifically by some famous artists of the time friends of Carrie. For example, Marcel Duchamp and Alexander Archipenko, just to name two. If you happen to visit that museum, stop and look at it carefully, because there is a good part of the artist's history between furniture and walls. Carrie, in fact, was the sister of Florine Stettheimer, eccentric painter in New York at the beginning of the century, accustomed to hosting at home the most important figures of the twentieth century American culture. And here is the magic of this doll house, which is a real treasure not only for children, but also for any adult who has, at least once, dreamed of living in New York, just when this metropolis conquered the title of capital of the century. Unfortunately with the Stettheimer doll's house you can not play, but no fear because today the design has gone wild and gave birth to a large series of really creative doll houses ... with such meticulous details that you immediately want to open the door and go in there. Sit at the table and pour a cup of tea. Such as the Mini Home or the Big Mini Home designed by Eero Aarnio for the Finnish brand Tactic: a set with pieces of furniture and artist's pieces (do you recognize Puppy, also by Eero Aarnio?). Or the modern Miniko villas, real miniature houses, made of fine materials and hand finished by the Polish brand Minjio (in Italy you can find them from UnduetrestellaSTORE). The French fashion house Encore! tip on modular to be furnished as very romantic rooms, inhabited by many bunnies in fabric, while thinking in large Liliane that offers a villa on wheels, perfect for us to play dolls and dolls. If you are one of those with your head always in the clouds, your perfect home is the Rock & Pebble cloud-house, while lovers of the classic Art Nouveau style will find hospitality in one of the delightful Sylvanian Family. E se volete leggervi anche un buon libro, lo trovate (ma dovete costruirvelo da soli) ne La mia piccola libreria (Rizzoli)… iperdibile! E voi, in quale storia vorreste entrare? And if you want to read a good book, you can find it (but you have to build it yourself) in My little bookstore (Rizzoli) ... iperdibile! And you, in which story would you like to enter? "Siamo felici di vedere ancora una volta le due varianti di dollvillas di DollsVilla by Liliane. Ci conosciamo da tanti anni. Non ho mai visto una casa di bambole così "giocata" da bambine e bambini. In ogni nostra esposizione era il catalizzatore dei bambini. Non è soltanto una casa delle bambole. È una risposta intelligente per essere bambini e giocare! Grazie Style Piccoli, grazie Oriana Picceni, come sempre." "We are happy to see once again the two dollvillas of DollsVilla by Liliane. We've known each other for many years. I have never seen a doll house so "played" by little girls and children. In all our expositions it was the catalyst for children. It is not just a dollhouse. It's an intelligent answer to be children and ply!". Petit & Small blog: "At unduetrestella Design Week, you can also find amazing designer toys from Dollsvilla [et al]. These playthings bring together creativity, design and fun. Do not miss them out!" 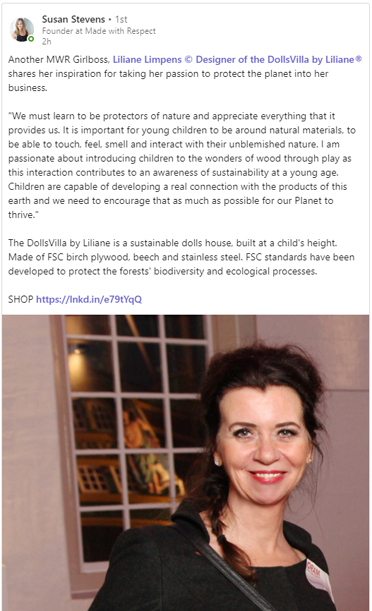 "Some brands that caught our eye: DollsVilla by Liliane®". Article about the exhibition Now, Now, and Now! 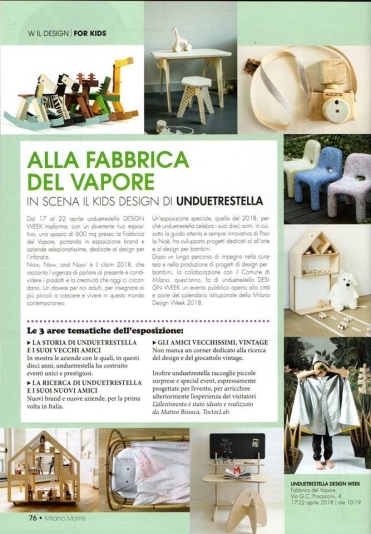 Unduetrestella design projects for children. 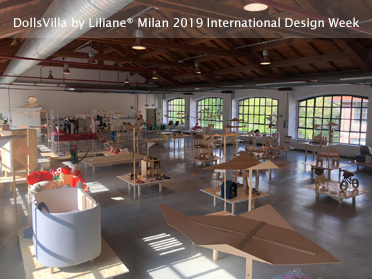 Also in 2018 the DollsVilla by Liliane® is present in Milano during the Salone Internazionale del Mobile. 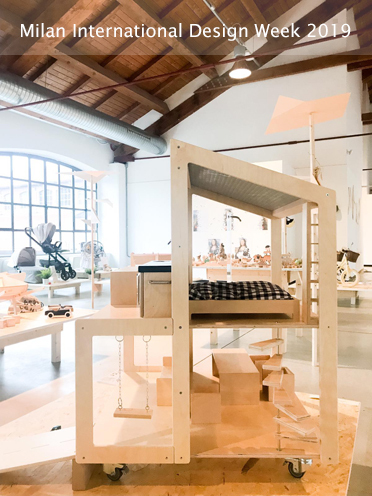 Thanks to the support of Municipality of Milano, Unduetrestella DESIGN WEEK is hosted in a very prestigious exhibition space: Fabbrica del Vapore, a large former industrial area close to the city centre. Fabbrica del Vapore is an important exhibition space hosting big and international shows dedicated to contemporary art and culture. 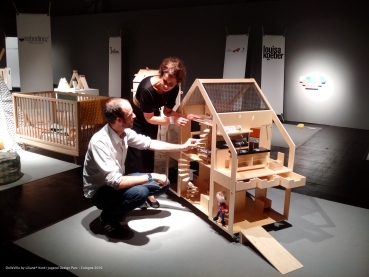 "DollsVilla Global (NL): conceived and produced by the designer Liliane Limpens creates two incredible and innovative models of dolls houses on wheels. 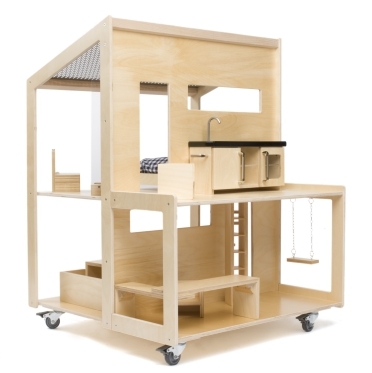 The child heigh DollsVilla is a sustainable dollhouse on wheels for children’s most cherished 1:6 cars and dolls of 30 centimetres. With a cool design interior, stainless steel roofplates, a car ramp and three trays. www.dollsvilla.com". Paola Noe of Unduetrestella: "It is our duty as adults, looking to the next generation, to emphasize the strength and power of childhood along with our responsibilities, adults teaching children to grow up and live in this contemporary world." 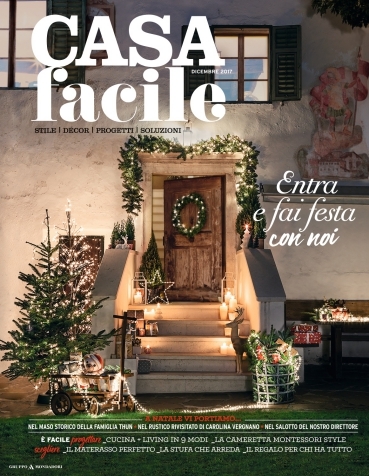 The renowned Italian design-lifestyle magazine CASA facile published an editorial about the Dutch design DollsVilla by Liliane®. Doll houses but also mini-kitchens are part of the so-called imitation play. They give children the opportunity to repeat gestures and situations that they have seen in the adult world. In this way they refine their movement skills and their perception of reality, the awareness and the expression of their own emotions. The play makes children aware of their own inner world and of the world around them. 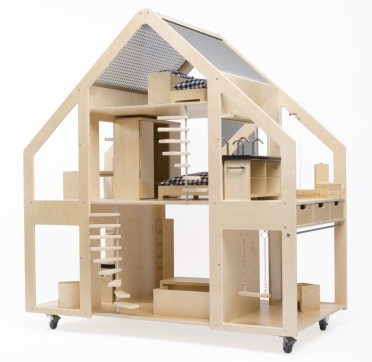 Dollhouse of birch wood [Liliane, cm 120x62x130h € 1.988]. La rinomata rivista italiana di design-lifestyle CASA Facile ha pubblicato un editoriale sul design olandese DollsVilla by Liliane®. Le casette ma anche le mini cucine fanno parte dei cosiddetti giochi di imitazione. Permettono ai bambini di ripetere gesti e situazioni osservati nella vita degli adulti; In questo modo si affinano la manualità e l ‘osservazione della realtà, La consapenolezza e l’espressione della proprie emozioni. Il gioco rende il bambino consapevole del proprio mondo interiore e di quello esteriore. Casa delle bambole in betulla [Liliane, cm 120x62x130h € 1.988]. 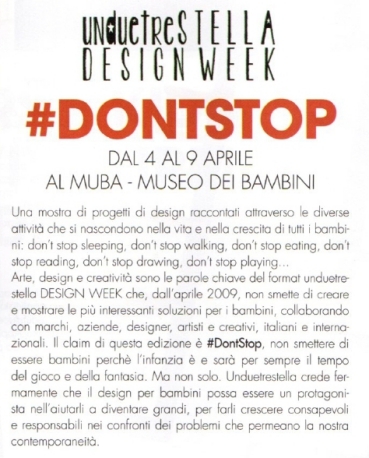 "Questa settimana non ho avuto il tempo materiale di raccontarvi le meravigliose novità di design per bimbi che ho visto al #UNDUETRESTELLADESIGNWEEK @ MUBA - Museo dei Bambini Milano al #fuorisalone domenica scorsa." "Mi impegno piano piano a mostrarvele, perché sono realtà artigianali meravigliose. 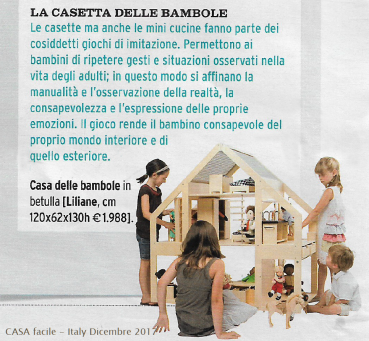 Io mi sono innamorata di questa casa delle bambole fatta interamente in legno di DollsVilla by Liliane® Dopotutto...chi di noi non ha mai sognato una casa delle bambole? ❤". 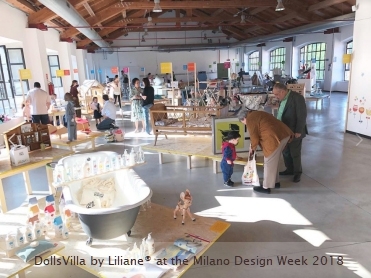 The DollsVilla by Liliane® is in April in Milano, as part of the exhibition Art and Design for Kids in MUBA - Museo dei Bambini Milano from April 4 to 9, 2017. During the Milan International Design Fair | Salone del Mobile | the unduetrestella Design Week. "DollsVila Global [Netherlands]. Dutch brand run by Liliane Limpens, designer of the DollsVilla by Liliane. The child heigh DollsVilla is a sustainable dollhouse on wheels for children's most cherished 1:6 cars and dolls of 30 centimetres." "With a cool design interior, stainless steel roof plates, a car ramp and three trays. #DontStopHousing". "The DollsVilla by Liliane® is the most loved piece at the exhibition. A lot of interest! also from journalists." 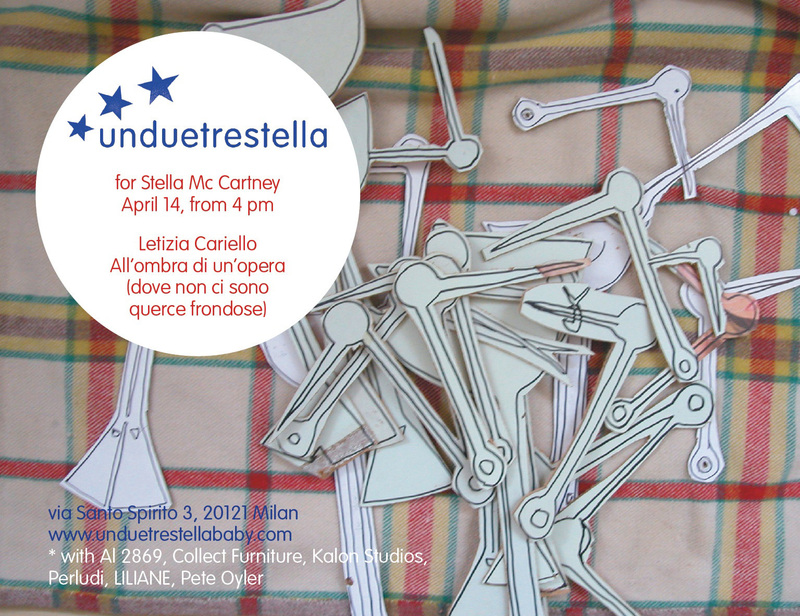 Paola Noe of unduetrestella, initiator Art and Design for Children in the Children's Museum MUBA Milan. Press day Tuesday, April 4 from 2 p.m. - 4 p.m. The purpose of MUBA Milano is to create and promote cultural expressions aiming at encouraging stereotype-free creative thought in children and prepare them for a society which requires greater and greater creative attitudes. MUBA develops and spreads non formal education with a view to promoting an innovative culture focused on children direct experience. The new C-More Concept Store at the Honig Complex in Nijmegen proudly presents the dutch DollsVilla by Liliane® to her audience. In the LOFT | ROOM of C-More, in the centre of the shop, existing and starting brands are mixed. The DollsVilla by Liliane® is part of the Children's Room, along with other high quality designer furniture. 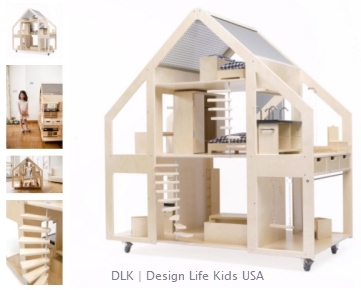 Kid's Wear Magazine: "The Liliane DollsVilla is far more than a simple dollhouse; it has been designed by Dutch designer Liliane Limpens for dolls that are one foot tall, making this house unique in its genre. Liliane created this doll house because there wasn’t a sustainable home for the size of dolls children prefer to play with. Putting down roots on ethical values this Villa will make children feeling real owners of their space." kid’s wear, established in 1995, is a magazine for children's fashion, lifestyle and culture which is unique anywhere in the world. Twice a year, for the beginning of each fashion season, the world's best photographers and many of today's eminent photographic artists interpret fashion and contemporary lifestyle over 250 pages. They rub noses with both established and new writers who write about childhood in today's world in articles, essays and short stories. By way of recognition for its ongoing work – in 2015, kid´s wear celebrates its 20th anniversary – the magazine regularly receives major awards. Recent awards include commendations from the Art Director´s Club New York and the Art Director´s Club Deutschland. kid’s wear has an international outlook and an international readership.The magazine is published by renowned photographer Achim Lippoth. “The most beautiful magazine in the world!” | Bruce Weber. 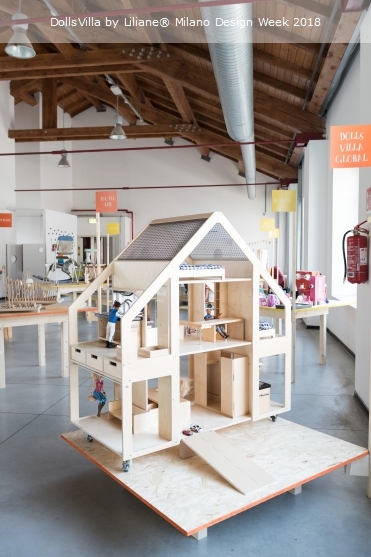 De Kleine Fabriek: "Na een presentatie van de PoppenVilla by Liliane® op het prestigieuze Kids Design at Superstudio Milaan, is de PoppenVilla by Liliane® nu vers terug in eigen land. De Kleine Fabriek Amsterdam toont de villa voor het eerst." Liliane Limpens: "De PoppenVilla by Liliane® is een uitingsvorm van een eerbetoon aan kinderen. Als hùn kinderen – de poppen - in een veilig en sterk huis wonen, heeft dat haar weerslag op het welbevinden van de ouders. 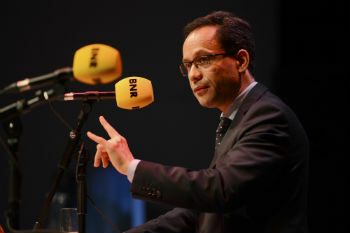 De villa is een domein waar uitsluitend de kinderen de waarden en normen, omgangsvormen, perspectieven en vrijheden bepalen en kunnen beïnvloeden. Volwassenen hebben er niets te zeggen." Blogger Judith de Feijter | Savedwithstyle: "DollsVilla by Liliane®. Twee enorme PoppenVilla's kon je bewonderen in de stand van LILIANE. Ondanks dat ik nog niet te maken heb met poppenhuizen, spreken deze villa's mij enorm aan. De achterliggende gedachte van eigenaresse en ontwerpster Liliane Limpens is erg interessant en dan te bedenken dat zij zelf de poppenhuizen met veel liefde heeft gemaakt. Ik wil graag meer over dit mooie concept vertellen, dus binnenkort een uitgebreid artikel." Tijdens de Internationale Milaan Design Meubelbeurs 2015 start de eerste editie van een nieuw design project voor kinderen: Ki.D.S | Kids Design at Superstudio. De Nederlandse PoppenVilla by Liliane® is geselecteerd om er acte de présence te geven. "As for the selection of companies and brands participating to Ki.D.S. 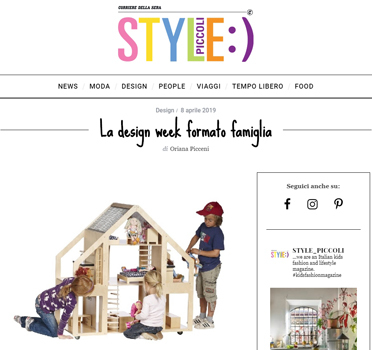 | Kids Design at Superstudio the Italian organizing company unduetrestella keeps up with its research and world-wide scouting, to highlight brands and companies dedicated and involved in creating and producing the best design for kids." 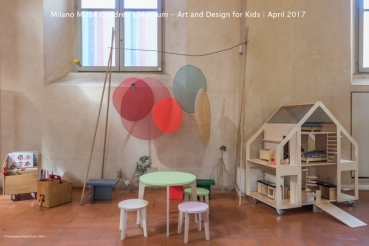 "The eminent spaces of Superstudio Più, headquarter of the new project SuperDesign Show during the Design Week 2015, opens the door to the world of children, hosting Ki.D.S. Kids Design at Superstudio, an ambitious exhibition project by the most interesting international furniture brands and companies for infants." Museo del Novecento - museum van de twintigste eeuw - presenteert tijdens de International Design Furniture Exhibition de PoppenVilla by Liliane® in hartje centrum van Milaan | vanaf 17 april 2012. Internationale ontwerpers presenteren in Milaan hedendaagse kunst en design meubels voor kinderen. Kidsroom - Zoom 2012 | 'We never give up!' toont de objecten op twee projectlocaties in het centrum van Milaan, waaronder de PoppenVilla by Liliane® leading en light. The 'Hôtel particulier: a Parisian ambition' exhibition in the Cité de l'Architecture et du Patrimoine is showing an architechtural and historic architectural overview of Paris' famous mansions. The museum is holding intensive children’s workshops with three complete DollsVilla's leading. 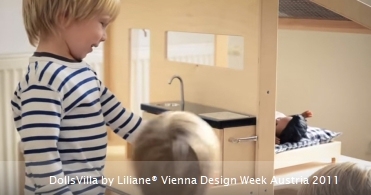 Presentatie van de PoppenVilla by Liliane® in Oostenrijk, tijdens de Vienna Design Week. 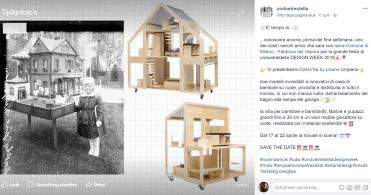 Dolores Wally, architect en journalist, oprichter tijdschrift | blog Kleinformat: “Temidden van kunst-objecten en design meubels voor kinderen van meer dan 20 internationale ontwerpers was de mooie PoppenVilla by Liliane® voor mij een hoogtepunt." De PoppenVilla by Liliane® wordt getoond in Graz Oostenrijk, tijdens de designmaand van 7 - 21 mei 2011. Graz heeft de status 'Unesco City of Design'. Internationale ontwerpers tonen er hedendaags design voor kinderen. Creative Industries Styria Graz Austria | Kidsroom Zoom! Stella Mc Cartney Milaan presenteert de PoppenVilla by Liliane® tijdens de introduktie van een nieuwe kinderlijn. 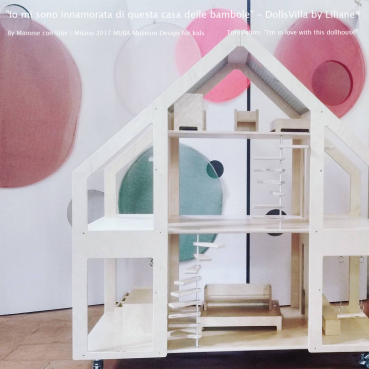 Internationale ontwerpers presenteren in Milaan hedendaagse design meubels voor kinderen. Kidsroom - Zoom! toont de objecten op een projectlocatie in het centrum van Milaan, zoals de PoppenVilla by Liliane®. De PoppenVilla by Liliane® was winnaar van de nationale onderscheiding voor innovatieve ontwerpen 2000. Voor het eerst in de geschiedenis van het 30-jarige bestaan van de Trade Mart won een speelgoedprodukt deze prijs. Kinderwinkel Little Dreamers in Ierland: "Ik ben een groot bewonderaar van de PoppenVilla by Liliane®. Ik zag tijdens een zakenreis de villa in een winkel in Düsseldorf." Het CoolBrands project geeft inzicht in merken die zich als cool percipiëren. De merken worden door consumenten in Nederland verkozen. 'Hours of fun with the DollsVilla by Liliane®'.